Before an agent reads your novel, they read your pitch. So how can you write one sure to impress? Get help from seasoned editors Arielle Eckstut and David Sterry (a.k.a. The Book Doctors) during Pitchapalooza 2018! 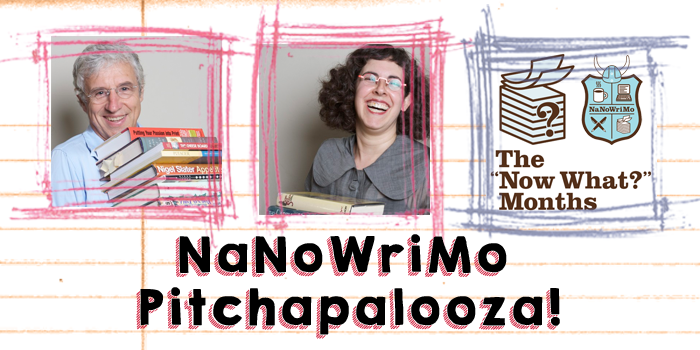 Write a 250-word pitch of your book and email it to nanowrimo@thebookdoctors.com. Do not attach your pitch, just paste it in the email. Include your title and your name at the top of your pitch. All pitches must be received by 11:59PM PST on February 28, 2018. Twenty pitches will be randomly selected from all submissions. The Book Doctors and two guest judges will then critique the pitches during a live webinar on March 15, 2018 at 5PM PST, so you get to see what makes a great pitch. At the end of the webinar, one winner is chosen from the group, and they receive an introduction to an agent or publisher! Whether or not your pitch is selected, the Pitchapalooza webcast is fun and educational! Everyone who watches the webcast away with concrete advice on how to improve their pitch as well as a greater understanding of the ins and outs of the publishing industry. Learn more about the contest, the webcast, and how to write a great pitch.